Murphy was the fifth dog placed by the fledgling new GRROWLS group in February of 1992. He was given up by a woman who adopted him from the SPCA, so he already had at least 2 homes. But he never moved again after he was adopted by Kathy Torres who says he was as affectionate and loyal a companion as anyone could ever have wanted. 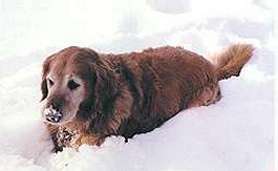 When Murphy passed away in June of 1999, his veterinarian estimated him to be 14 years old.